Another game, another loss, and a lot more questions left unanswered. 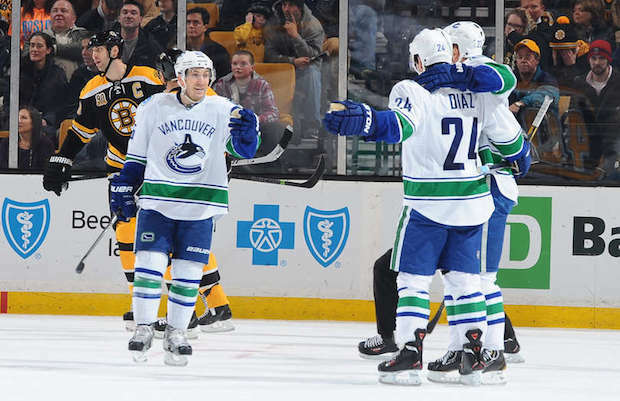 Last night’s game was probably the most uneventful Canucks vs. Bruins game in a long time. But I suppose when one team is not only mired in a deep slump, but also missing a good chunk of their regular roster due to injury, and the ones who did dress seemed unwilling to engage, the temperature cooled down considerably. Henrik Sedin is hurt. That much is obvious. He can’t take face-offs and he can’t take a hit. And after every shift, when he skates back to the bench, he has that pained look on his face, kinda like those poor puppies in the SPCA commercials. I know Hank is tough – you can’t play 679 consecutive games in this league without being tough. I understand he’s the captain, and he wants to lead his team, which is severely undermanned right now. This is all admirable, but at this juncture of the season, why the hell are the Canucks risking a longer-term injury? The Canucks’ injury list includes Chris Higgins, Brad Richardson, Mike Santorelli, Dan Hamhuis, Kevin Bieksa and Chris Tanev. If you include Hank, which, really, the Canucks should, that’s four top-9 forwards and three top-6 d-men (even arguably top-4 d-men) – or half of the top part of the lineup – out of the lineup. As good friend of the blog, Gina from Canucks Corner tweeted last night, injuries aren’t an excuse, but they are a factor. In this age of parity, there aren’t many teams in the league that can withstand that many injuries. Which leads me to today’s $64,000 question – what should be considered as realistic expectations for this Canucks team right now? When I worked the Vancouver Grizzlies games at then GM Place a while ago, I used to remark how Bryant “Big Country” Reeves almost always played better after he was hit early in the game. It was as if a Shaq or Greg Ostertag elbow to the face served as some sort of wake-up call for the big fella. Last night, I thought David Booth was one of the better Canucks. (Giveaway that led to the Daniel Paille breakaway goal aside.) After Johnny Boychuk nailed him with a nice hit along the boards, he was noticeably more physical and had a little something-something going with Boychuk the rest of the game. Maybe, like Big Country, Booth just needed a wake-up call. Raphael Diaz had a pretty solid Canucks debut. He led all Canucks skaters with 25:26 minutes of ice-time and he scored the team’s lone goal to boot. According to Extra Skater, he finished with a 65.0 CF%, which, in layman’s terms mean that, generally, good things happened for the Canucks when Diaz was on the ice. Considering their depleted lineup, the Canucks were okay for the most part last night. But after their loss in the 2011 Stanley Cup Finals, getting up for the normally heated and emotional games against the Bruins was never a problem for them. Their problem was getting up for the games that followed.